(MP103). Alma Claude Burlton Cull (1880-1931). Watercolour signed and dated 1921. The painting may be dated 1921 but it depicts the ships a few years earlier as by 1918 LION had a conspicuous cap to her fore funnel which is not in evidence here. Winding back a little from then its tempting to believe that this was yet another painting of the illustrious Beatty and his redoubtable flagship which he left in 1916 when becoming C-in-C Grand Fleet: but the build up of searchlights which Cull has painted around the centre funnel suggests a year or two later. The missing funnel cap rules out 1918 so we are probably looking at a painting of 1917 which was then finished and dated in 1921. 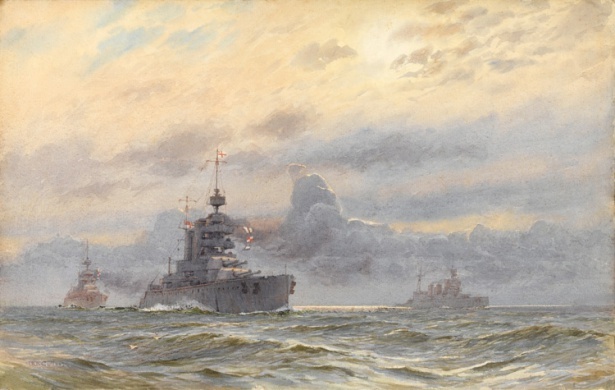 The widely respected and admired Vice Admiral Sir William Pakenham KCB KCVO (”Old Packs” to his mates) had succeeded Beatty in command of the Battle Cruiser Fleet on 28th November 1916 and at the deduced time of this painting his flag captain was still Captain Roger Backhouse, CB CMG. PRINCESS ROYAL was commanded by another admiral in the making, Captain John Kelly; and NEW ZEALAND by Captain Richard Webb CB ADC. The Navy Lists of the time make NEW ZEALAND’s funding origins very clear: “Was built at the charge of the New Zealand Government”. Cull has deployed his usual incomparable skill with sea and sky in this beautiful watercolour which although fairly heavily foxed has cleaned up very satisfactorily.